After the shakeup in the Hawks midfield there are plenty of possessions to go around and Roy has a look to see if a certain ‘Forward’ is likely to take advantage of it. Smith has been a Fantasy gun since making the leap to AFL level, only once averaging less that 80 with 77 over his six seasons. In the last four years he has been really impressive, missing just four games while averaging 86, 94, 97 before dropping back to 89 in 2016. 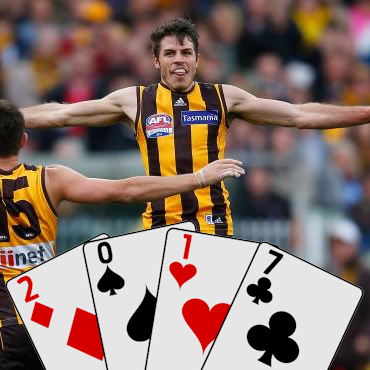 After the departure of Sam Mitchell and Jordan Lewis, the Hawks are somewhat an unknown commodity, but one thing is for sure, Smith is a player they will be expecting to return to his best in order to fill the huge void on the back of being named in the new look leadership group. With their two biggest ball winners gone, it is likely Smith will have to do a large chunk of work up the ground so his possession count should reflect this with a career high of 25+ a good possibility. The fact he is DPP provides us with a nice gift in the forward line given we have been stripped of many popular 2015 options and to be frank… The drop off is fast! After being slightly off the boil last year, he provides great value given his average dropped by a significant eight points and the increased responsibility alone should have those points covered. He has a nice ceiling as we saw in round 21 against the Roos when he collected 33 possessions, took 11 marks and laid seven tackles to score a thumping 146. When Smith recorded his impressive 90+ averages, the Hawks were commonly known as the ‘High scoring Hawks’, but that certainly fell away last year as they lost their ability to dominate their competition. My issue here is that we haven’t really seen Smith in a team that is no longer considered a premiership contender. Although his responsibility is at an all time high, the going will be tougher than ever given Mitchell and Lewis won’t be feeding the ball to anyone on a platter. Queen– As a FWD, I think Smith is a great selection and will push his average up, possibly giving his career high a nudge. The only reason he is priced so well is due to two games I am willing to ignore where he turned in shocking efforts of 39 and 57. In 2015 he had an impressive 12 hundreds including Finals and anyone named as a forward who has that scoring ability is well worth considering. Who is the DPP FWD best pick? FOLLOW ME ON TWITTER: @RoyDT for all thing AFL Fantasy (and more). Got something to say about the deck? Use the hashtag… #DeckofDT. Cheers for the article Roy…Smith hasn’t been on my radar so far this season but with this year’s crop of fwds decimated and your pretty good case for him he has come into the frame…A definite watch during the community cup to see what role he looks like playing this year.